I have been absolutely loving this little "Capsule Experiment" I've been doing over the past few seasons and I'm completely hooked! A capsule wardrobe is a well edited, "mini wardrobe" - a small collection, made up of carefully chosen, versatile pieces you LOVE to wear, and that can be mixed and matched to create a myriad of different outfits. There are heaps of different blogs that discuss the benefits of a capsule wardrobe, and how to make one, so instead of going over those "basic steps" again, I figured I'd approach this from a slightly different angle and talk about how to incorporate colour into your capsule. (If you're just starting out though, check out Un-Fancy, Project 333 and Light By Coco. They give a great rundown on how to get started). The problem I had when I was first getting into this was that a lot of the capsules that people were talking about and showing, either on their blogs or in youtube videos, were more geared to having a monochrome, neutral based wardrobe. That's fine if you love that look, it's versatile and makes it super easy to mix and match...but for me, I wanted some colour! If you've read my blog for a while, you know I do love my neutrals (floaty white tops are my thing) but I also love to wear bright colours and patterns, especially when the weather is so sunny and warm (like it is a lot of the time where I live) - it just doesn't feel right wearing really dark shades in that kind of weather! So these are my tips that I would suggest giving a try if you like a little colour in your clothes! Of course, this is what has worked for me, you might not agree with some of them, but hopefully they can provide a little inspiration if you're not sure where to start! 1) Start with what you have - don't go out and buy a bunch of new clothes to create you're capsule. I think it's really important to experiment with what you have first, because over the course of a few months of living with a smaller wardrobe, it really makes you think about your style and helps you to define it. You'll realise what works for you and what doesn't, and often this is quite different to what you originally thought. A lot of the time when we go shopping, we end up buying pieces that are more suitable for a "fantasy life" (for me, this might be a pair of beautiful killer heels that I will never actually wear), and the whole point of a capsule is for it to be filled with clothes you can actually wear, not ones that you wish you could wear. 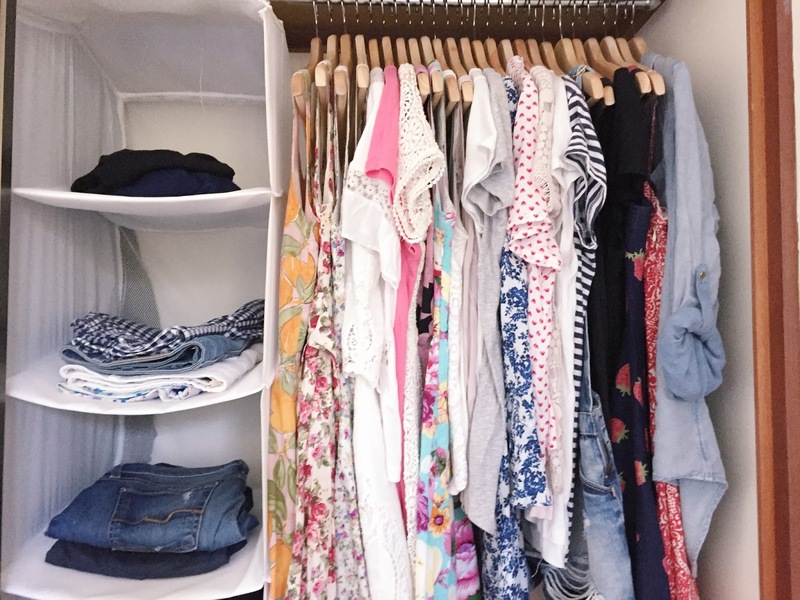 As you live with a smaller wardrobe, you realise what you do and don't need, and that makes the shopping process much easier and more effective, so leave that for later on! 2) Choose a colour palette. Seeing as a capsule wardrobe is made up of a limited collection of pieces, you want to make sure they work well together, so you're not limited when trying to pair items together. You might already have a pretty good idea of the colours you love to wear, but if you're not sure, just have a look through your wardrobe and pick out the pieces that you feel the best in, or the ones you already know you wear all the time. You'll likely start to notice a theme emerging when you pick out these pieces and that's a good place to start! For me - I have always gravitated towards either pink or white (whenever I go shopping these are the ones that always grab my attention), so these are the two key colours in my wardrobe. Another colour I wear a lot is navy so that also features heavily. Now, this doesn't mean that you can only wear these main colours, just that these are the ones that you base the rest of your wardrobe around when choosing accent colours that will (for the most part) go with any of these main colours. Dresses are the easiest way to incorporate fun colours and patterns into you capsule wardrobe because they're a full outfit in themselves! This is the main reason I've been able to include lots of different colours and patterns, because you don't need to worry about things clashing! I actually have a few dresses in my wardrobe that don't really fit that well with my colour palette, but because they're a full outfit, they're easy to wear and it works. You can easily change the look of the dress simply by wearing a different pair of shoes, adding a belt, throwing on a cardigan etc. I also tend to keep my shorts, and pants (I rarely wear skirts) on the more neutral side, as it means my colourful/patterned tops can be paired with almost any of the bottoms, making it super easy to create outfits. I usually keep jackets or cardigans neutral too, (or at least in a colour that goes with almost everything) because this makes them much more versatile. 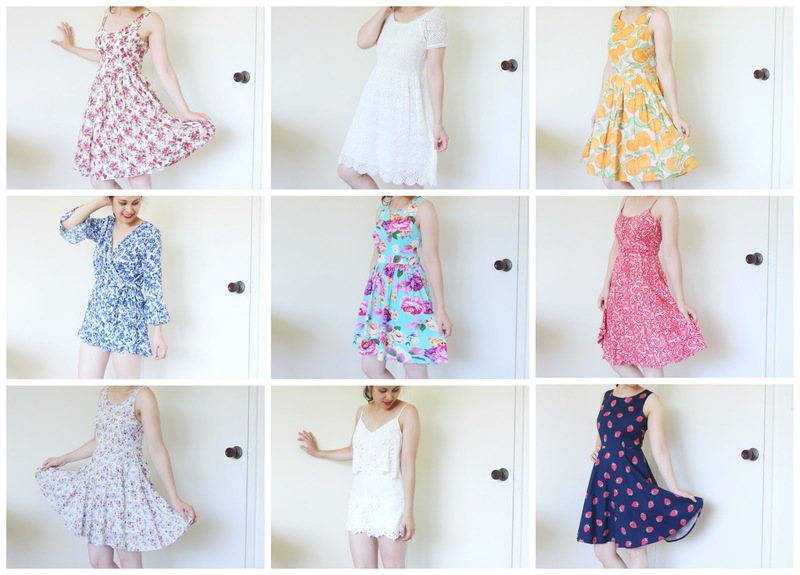 This is what works for me because I love my bright summer dresses and tops, and really enjoy having a bigger selection of these in my capsule to choose from. For me, building my wardrobe around my dresses has worked really well - but of course it will be different story come winter time! Just remember though, there really aren't any "rules" here, these are more just "guidelines" and tips that have worked for me. Maybe you love patterned pants or skirts - in that case, just flip my suggestion around and include more neutral tops! I actually think you should choose the colourful pieces you love (based around your colour scheme), and then focus on building the rest of your wardrobe around these, mixing in the neutrals you need to make it work. 4) Include neutral pieces to tie everything together. So this is a pretty obvious tip that I've already kind of touched on. If you have a wardrobe full of only colourful pieces or crazy prints, it's just going to end up as a big rainbow mess. The neutral pieces are the glue that goes with everything and ties it all together. You want to make sure you have basics (simple tops/cardigans/trousers) in neutral colours that pair with your more interesting pieces, as this will make it much easier to mix and match! For my Sumer Capsule, two of my "main colours" are already what I would call "neutrals " - navy blue and white. These go well with pretty much everything in my wardrobe, so that makes it easy for me. Some of the neutral basics I've included in my capsule include; simple grey/black/white tops, navy blue cardigan, black cardigan, navy trousers, blue jeans, white shorts and denim shorts. These basics can be paired with the more brightly coloured pieces in my wardrobe and just help to make everything work together! I personally don't include shoes/bags/jewellery as part of my capsule wardrobe "count" but I've still been trying to keep them to a fairly minimal number. Because my wardrobe is pretty colourful, when it comes to accessories I tend to go for the more neutral options that are very versatile - I have three bags - one black, one tan and one neutral beige-y coloured one - and with these three I'm pretty much covered. Same goes with shoes - I usually stick to black and tan. My most worn are usually my tan sandals, or tan wedges for something dressier, or black ballet flats or even heels if I want to take it to the next level. Of course - some people just love statement shoes or bags - and if that's you then go for it! As I said before, I'm just sharing the tips that have worked for me and my capsule so far! This is steering more into just general capsule wardrobe tips now, but I think this is particularly important if you love bright colours, as they do draw more attention than if you were just wearing monochrome! Of course, you can wear whatever you like, but I always find that I look and feel most comfortable when I dress in a way that flatters my body type. I've finally realised over many years, that I really don't like how pencil skirts look on me. They accentuate areas I don't really love and in particular I feel like they draw attention to my very bowed legs! I am probably the only person who would notice this, but because I notice it, it affects how I feel. So if I feel better wearing a dress with a fuller skirt, as opposed to a really fitted one - why not just embrace it?! If you're wearing bright colours, you want to make sure you're drawing attention to the features you love - and choosing the right silhouette can make such a difference with this. This is an idea I heard from Youtuber Hello Cathy. Think about a "Wheel of Fortune" that is separated into segments - that are either black or white, with just one bright red panel. As the wheel spins, you're obviously going to notice the red panel going round so much more because it stands out against the black and white. The same goes for a capsule wardrobe that's made up of mostly neutral pieces, but then just has one bright top or dress thrown in. Because it's just the one statement piece - you notice it more. It kind of emphasises the high rotation of items and that you're wearing the same top/dress over and over again (there's nothing wrong with that, but I'd prefer not to draw attention to it if possible). On the other hand though -if your capsule is made up of numerous coloured pieces within a similar colour palette, instead of noticing just the one stand out dress as it gets rotated through, it all just kind of becomes a gorgeous blur of colour and print and meshes together - and even though you're wearing the same pieces over and over, it's not as noticeable. So those are my tips! I hope you've found them at least a little bit helpful! I just recently found these posts on Into Mind that go much more in depth talking about colours - so check them out if you're interested! To be honest I didn't actually spend that much time working out the specific "main colours", "accent colours", "neutrals" like they discuss in these articles (I just sort of looked through my wardrobe and picked out what I thought would work, and luckily it did! ), but these would probably be quite helpful if your wardrobe is a big rainbow mess and you're not sure where to start! Also, just wanted to mention one more thing that I think is important to remember about capsule wardrobes and that seems to get lost in a lot of the advice that's given about them. It's fine to have those "special pieces" that don't necessarily work within your capsule for everyday, but are perfect for special occasions. Wonderful post Lauren! I'll definitely be using these tips to develop my wardrobe in the coming months. Really helpful and inspiring. So many other capsule wardrobes are dull boring and repetitive. I love colour and pattern.